Make a gift to the Western College Legacy Circle through a secure giving site or download gifts/pledge form. View or download the Western College Legacy Circle brochure. Not too long ago I received an e-mail from a student at Miami University. In replying I asked where she lived on campus. This was her answer — not an address, not a dorm, but a place. Even today, on our former campus there’s an undeniable Spirit that puts Western’s name on the tip of a student’s tongue as something special, set aside. If you were to take a walk along our Western campus, you would see new sites that exemplify that the Spirit of Western is indeed still felt, even by young Miami students, and by Miami’s faculty, staff and leadership. The new dining hall on Western campus is permanently named Western Dining Commons, and a new walkway that runs along Western Dining Commons and the newly constructed residence halls is forever named Western Walk. Amazing and wonderful, isn’t it! Your Western College Alumnae Association board is working diligently to secure that Spirit for all time. I write to inform you of plans for a lasting legacy and ways you can help. However, first, let me recap what has happened so far. In 2010 the WCAA, Inc. Board of Trustees voted to desist when the last graduating class reaches its fiftieth reunion year, 2024. Since that time, methodically each empowered and impassioned Board has been planning for that date by establishing and fulfilling goals. It is so exciting to now roll out our new Legacy goal. Once again, it’s to be funded by the generosity of our alumnae through donations, pledges or planned giving opportunities. How generous and how participatory we are will define the extensiveness of our lasting legacy project(s). A significant plot of land across the creek that runs behind Patterson Place, alongside Western Walkway, has been set aside for our landscaped Legacy project. It’s focal, it’s functional, it’s beautifully framed. 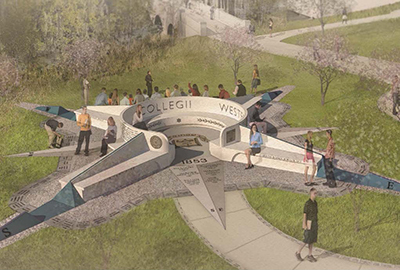 This project, entitled the Western College Legacy Circle, is a campus gathering area. As you see in the enclosed materials, the focal point will be the Western seal embedded in the center and the Story of Western will be reflected in the generous seating area.